Social media, it seems, is going to become a more prominent part of our lives, whether or not we want it to be. Although some of us remain sceptical about the mundane information overload, social networking occasionally has more pros than cons — as evidenced by Waze, a new social networking traffic app that was recently launched officially in SA. Waze is a free community-based navigation app that relies on its community of users to update its database both passively and actively so that “wazers” (Waze users) receive alerts about gridlocked traffic, accidents, speed traps and other traffic-related information. The app also offers voice-guided navigation. Using computer algorithms, Waze uses various streams of information, including the speed at which wazers are travelling, to determine where traffic jams are occurring. The app constantly updates the real-time information so that other wazers are able to see the location of traffic jams. Wazers can also submit their own real-time traffic updates. The app can be downloaded for use on smartphones through the Apple App Store, Android Play, Nokia Ovi Store and BlackBerry’s App World. After a person registers to use Waze, they will also have access to the site where wazers can edit map information. The maps are generated entirely by the Waze community. The app is being launched in SA by Mix Telematics, a global vehicle-tracking and fleet management company, which seeks to encourage safe driving habits and improve traffic information for all commuters, especially those in traffic-dense areas such as cities. Mix Telematics provided the base road grid from its existing positional database and wazers are able to update the maps at any point, either on the website or by driving on a new road and using the “paving feature” to show other wazers that a new road has been added to the map. “Because wazers can edit the map information, they can also delete roads or change road names. However, because this is a community of users, other wazers can make corrections to the information to ensure that the maps are accurate,” said Evangelos Gikas, Mix Telematics’ product manager responsible for Waze. “Wazers accumulate points as they drive and the more points they accumulate, the more access they have to edit the information on the site. It works in a similar fashion to Wikipedia,” said Gikas. Mix Telematics hopes to generate revenue from advertising and companies such as petrol stations and supermarkets that would like to place their location on the map. 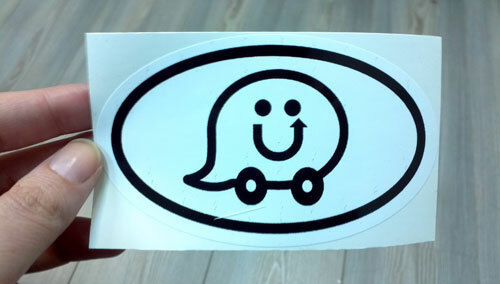 Waze was initially conceptualised by Israeli software engineer Ehud Shabtai in 2006 and was made available to users in 2009. To date, Waze is used in 45 countries by 12m, including 30 000 in SA. Gikas assured the Mail & Guardian that Waze did not access any information on smartphones other than GPS data. “People don’t have to use their real names when they register. However, as with all navigation apps, Waze uses 3G data and will also have an impact on a phone’s battery life. After using the app on my iPhone for roughly one hour over a distance of about 45km, I had used less than 1MB of data and the app had informed me about three traffic jams, two accidents and two speed traps. But it would be difficult to ascertain the exact amount of data the app used, because I had a few other apps — such as e-mail — using data concurrently. Waze was easy to use and it was simple to update the app about real-time traffic situations. The Waze maps were of a good standard and the app did the job of navigating sufficiently well.